The credit union has many varied types of savings accounts available to our membership. Each account carries a different purpose and may carry a different rate and requirements. It is important that members of the credit union learn to consistently save a portion of their earnings in some type of savings account. When you make an effort to save some of your earnings you will put yourself on the road to financial independence. If you have children, it is a good idea to start a credit union savings account for your children when they are young and add a small amount each payday. You can also teach them to add to this account when they are old enough to earn their own money. So if you have not saved in the past - today is the day to start. 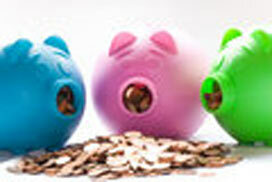 You may borrow against several types of savings accounts at a reduced rate of interest. Remember, payroll deduction is a painless way to save. This account is your main savings account and you must maintain at least $5.00 MINIMUM BALANCE in this account to be a member and use any of the other credit union services. This account is a liquid account so it's the account in which you will probably want to keep monies that you may need in the near future. Dividends on this account are credited monthly and posted to your account on the 1st day of each month. This account is available to be pledged on a Share Secured Loan. Click here to view the rate on this account. You may have a Star�Card with this account, if you are a member is good standing. THIS ALLOWS THE CREDIT UNION TO BE AVAILABLE 24 HOURS A DAY. YOU MUST APPLY FOR THIS CARD. This account is not for all members, but we found that members liked to put money away for their City Taxes, Real Estate Tax, Home Owners Insurance, a new appliance, down payment on a home or car or a hundred other reasons. This account allows you to set money aside in the Special 30 Share Account for a specific purpose when you don't want to co-mingle your regular savings. This account can help you budget better for those future financial situations that occur quarterly or semi-annually and drain your regular shares. The minimum deposit to open this account is $1.00 and dividends are credited monthly and posted on the 1st day of each month. Click here to view the rate on this account. This account is offered for those members who want and need a vacation and it is important that the funds are available when it's time for vacation. The Club offers a systematic savings plan to give you the secure feeling that when you make your reservations for that dream vacation or that long weekend away you have the money to enjoy yourself. Automatic transfer from your share or draft account makes sure the dream vacation is not a nightmare. You can call the office to have your vacation club account opened and the proper papers sent to your home. The minimum deposit to open this account is $1.00 and dividends are credited monthly and posted on the 1st day of each month. Click here to view the rate on this account. This account is offered to those members who want to be worry-free when it's time to do their holiday shopping. Everyone knows how the holidays just seem to creep up on you and your wallet. This Club keeps you focused on your goal of financial independence by automatically transferring funds from your share or draft account each pay period to your Christmas Club. Next year when it's time to go shopping you will be able to "pay cash" for all your purchases and save money by taking advantage of cash sales and no interest on a credit card. You can call the office to have your Christmas Club account opened and the proper papers sent to your home. The minimum deposit to open this account is $1.00 and dividends are credited monthly and posted on the 1st day of each month. Click here to view the rate on this account. Need a great checking account? Come in and open a PFCU share draft account. The drafts you write are carbonized, so you won't ever have to worry if you forgot to enter the draft in your register - you can look at the copy. If you sign up for direct deposit of your paycheck, you are eligible for 2 boxes of personalized checks per year and an ATM card. There is no "per item" charge for drafts posted and a very small monthly fee. There is no minimum balance, but a $5,000 balance is required for dividends on this account, which are credited monthly and posted on the 1st day of each month. The requirements for a Master Money� Debit Card are an active share draft account. You can carry your credit union wherever you go with a Master Money� Debit Card. Sign up today! Click here to view the rate on this account. There are three convenient ways to reorder your share drafts, but if you need to change your Name, Address or Telephone number, you can only use OPTION 1. Several members have used OPTION 2 AND/OR 3 and their drafts were returned to the credit union with a return charge. When you use OPTION 2 AND/OR 3 the Name, Address and Telephone number will be printed on the Share Drafts as shown on the order form. Members will be charged for the cost of returned share draft boxes. Stop in, mail or fax your reorder form and note any changes required. This reorder form must contain your signature on the form. The order will be placed the same day if received by 3:00 p.m.
Sign in on www.PFCU.com, then click on WEB PAL II, sign on the WEB PAL II with your account number and PIN, click on Transactions, click on Reorder Drafts. You must have your reorder form available; you will need information from this form to complete the reorder process. Remember you should not use this option if you need to make changes to your Name, Address or Telephone Number. You must use OPTION 1 for these changes. Call 1-877-585-8777 to place a reorder over the phone. You must have your reorder form available; you will need information from the form to complete this process. Remember you should not use this option if you need to make changes to your Name, Address or Telephone Number. You must use OPTION 1.